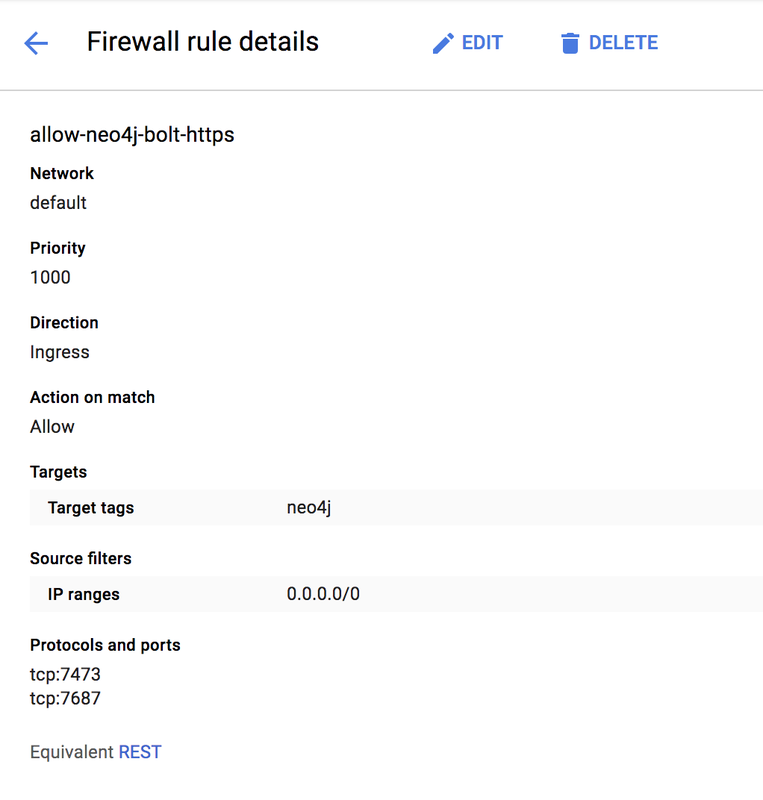 This guide explains how to deploy a single instance of Neo4j Enterprise on Google Cloud Platform. Before continuing with the guide make sure you’ve installed the GCloud Command Line Interface. We don’t have to open port 22 for SSH, that will already be done. The first line simply sets your project configuration to ensure you know where you are launching your instance. The second line launches an image found in a public project that we have provided. The image name neo4j-enterprise-1-3-4-9-apoc corresponds to an Ubuntu-based image that contains Neo4j 1:3.3.9, with the APOC plugin. If you get an “image not found” error, this may mean you are attempting to launch a version that Neo4j has not published. Note that the gcloud tool comes with many command line options that aren’t covered here. consult the documentation for a large number of options dealing with machine type, memory, available storage, and so on. The --tags argument is important, because it allows us to configure the correct network permissions in the next step. By default, Google will block all external access to the network services unless you open them. Navigate to https://[External_IP]:7473 and login with the user name neo4j and password neo4j. You will be prompted to change the password immediately. Please consult Neo4j Cloud VMs for details on internals of Google VMs, including how to stop and start system services, configure Neo4j inside of the VM, and more.